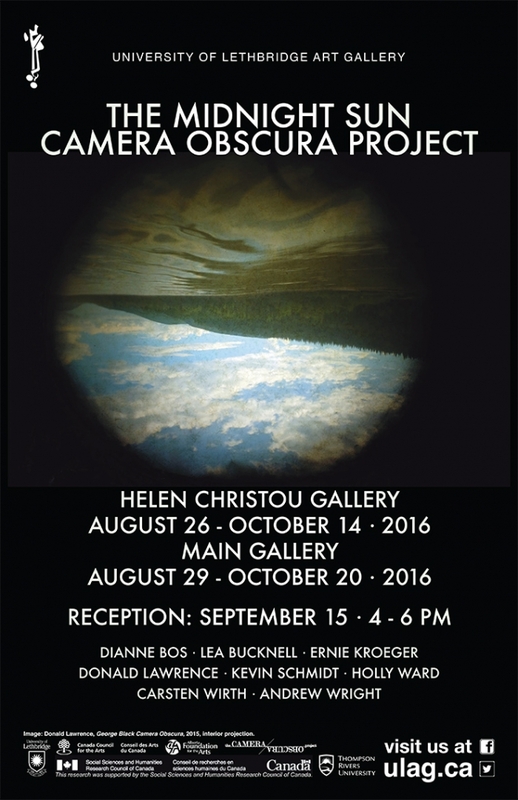 The Midnight Sun Camera Obscura Festival brought together an international group of artists and other researchers interested in cameras obscura and related optical phenomenon as a meeting place of art and science, cultural and wilderness settings, learning and play. The project was conceived by Kamloops-based artist and visual art professor Donald Lawrence and was funded by the Social Sciences and Humanities Research Council of Canada (SSHRC). The group of artists, scholars, and art students came together for summer solstice, 2015, in Dawson City, Yukon where they used the exceptionally long days and stunning landscape to produce a variety of art works. As is clear in the range of work proposed for this exhibition, the camera obscura holds a fascination with contemporary artists and audiences. Camera obscura simply means ‘dark room’ in Latin and was a term coined to describe devices devised to aid perception, but can include any darkened space into which light enters through a small opening (sometimes aided by a lens and a mirror). Mills attended the festival in the Yukon and has curated an exhibition out of the project for the U of L Art Gallery. This new phase of the project will connect the work with a wider public and, in addition to the exhibition, the U of L Art Gallery is working on a national tour and a major publication. The exhibition includes several of the cameras obscura – the actual objects for viewing and recording surrounding imagery; images projected by these devices; documentation of the event; and new work produced by the artists in response to the initial research and festival.